I our last session, the party discovered a waterfall that showed them some disturbing visions, and fought off a clan of Cave Rippers. Five were slain, but one escaped through a tunnel off to the east. Having entered the cave at the end of a long day of overland marching, the party decided to get some rest rather than give chase. They setup a camp just inside the cave entrance, placing small rocks in a pile facing the one eastern egress, to act as an early warning alert system in case more Cave Rippers returned. As the sun was setting, Ruby went outside to scout the immediate area. She discovered fresh humanoid tracks close to the cave, but was unable to follow them north once the ground turned rocky. She returned inside and reported what she had found, convinced no one was nearby. Yet after just a few minutes, Ruby heard a sound outside, like small rocks on dirt. The party extinguished their light sources, and under the last vestiges of sunlight, they could see someone walking past, just outside the low cave entrance. Abruptly, a face peered in at them. They stayed still and quiet, unsure of whether or not they had been spotted in the darkness, but after a few tense seconds, the person or creature went away. The party heard no other sounds, and the rest of the night progressed without incident. Freshly rested, the party broke camp and headed east, further into the caves. As the darkness swallowed them, Dai commanded his sword to light. Off to the north, the party could see a small ledge leading into a narrow, dark tunnel. To the east, the tunnel they were in continued to a large boulder which blocked their view. Dai carefully proceeded north, stepping up onto the ledge and revealing that the narrow tunnel curved northeast, and had several alcoves on either wall. As the rest of the party fell in behind Dai, he moved north and could see the end of the tunnel perhaps 30 feet ahead. The first two alcoves were empty save for some bones and cave detritus, but from a third leapt a Cave Ripper, directly at Dai. The creature’s claws missed their mark, however, and he felled it with one blow. All was now quiet, and the party searched the remaining alcoves, discovering 23 gold coins and a rusted helm. The party continued east, discovering that the boulder concealed an exit. They squeezed in behind the large rock and followed the tunnel, this time ending in a low wooden door. Ruby lent her sensitive Hobbit’s ears, and from beyond she heard sounds of a crackling fire. Impatient to get on with it, Adrog pushed Ruby aside and pulled on the door. It swung open on the first try, revealing a cavern 30 feet across. 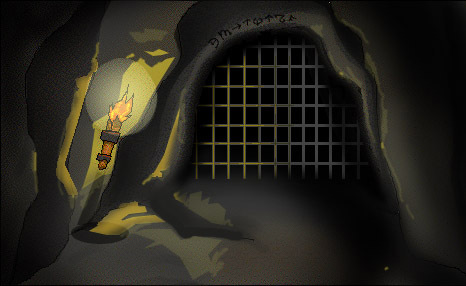 Torches on the walls provided a dim, flickering light, in which the party saw two men, clad in leather armor and seated near a fire to their north, against the cave wall. The smoke from the fire disappeared into a natural chimney. The men, clearly surprised, leapt to their feet and drew swords, slowly backing to the east, towards an open tunnel. Arsenios attempted to parley with the men, even as Dai and Adrog moved south and then northeast, cutting off any hope of escape. Trapped, the brigands opted for a fight, which did not end well for them. After a few minutes, both men lay dead, attacked from all sides. Ruby searched the bodies, but found naught, only noticing an insignia stamped on the leather armor near the shoulder, a scythe. The party searched the cavern and discovered another open exit to the southeast. A quick look showed a 10-foot cliff, beneath which was a pile of bones and a narrow cave with a mud-covered floor. The party opted to head northeast, into a narrow tunnel which led them up a small ledge and into a three-way intersection. To the east a tunnel stretched some 20 feet and turned south, out of sight. To the north, a rough-hewn staircase climbed 30 feet, what was at the top the party could not see, so they sent Ruby up to scout. She returned a few minutes later and told of a large, eight-foot tall creature with horns and fangs, its back turned and moving large, flat rocks onto an area of cavern floor. At that moment, a man appeared in the east tunnel. He was wearing chain armor with a scythe insignia, and wearing a sword. He seemed to be walking with purpose and was clearly surprised to see the party. Dai immediately ran at him, Sword of Thaxon blazing. The man cried out, drew his sword, and the battle was joined. What happened next surprised everyone, however. As Dai crossed the threshold into the eastern tunnel, a portcullis fell behind him, trapping him with the brigand. Meanwhile, the cries attracted the attention of the large creature to the north. With the sounds of the monster approaching, the party retreated behind the corner to the southwest, thinking they could surprise him. However, the large creature, seeing only two men fighting behind the portcullis, lifted it easily and joined the fray, letting it drop behind him. Arsenios and Ruby rushed to strike out at the creature from behind the bars, while Adrog struggled to lift the portcullis and help his friend. Dai fought bravely, killing the brigand but falling victim to the horned creature’s massive fists, even as Adrog managed to lift the bars. He propped the bars up with his shield, and layed into the horned giant, who was slain quickly with the help of Arseinios and Ruby, albeit a few minutes too late. Shaken, but realizing they had to make sure they were safe, the party searched the east corridor, which turned south and abruptly stopped, blocked by a cave-in. Now wondering where the brigand had come from, the party redoubled their search. Adrog finally found it – a stone out-of-place on the floor against the east wall, which when moved revealed a door in the rock. This slid aside and opened into a dark, narrow tunnel that headed east. Leaving it for the moment, the party headed north, up the stairs and into the horned creature’s lair. With a quick apology, Adrog took up Dai’s magical sword and followed. The 25-foot wide cavern was unassuming, smelled foul, and apart from a straw bed was empty. 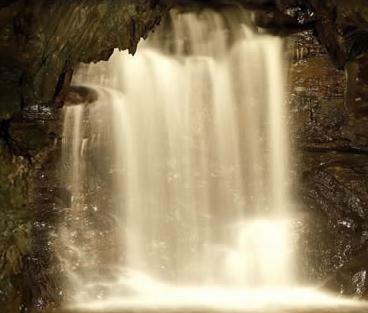 Sounds of rushing water could be heard to the north, through an open tunnel. A pile of large, flat stones was on the floor in a western alcove – this is where Ruby saw the foul creature working. Adrog moved aside the stones, and beneath them was a hole in the floor which contained a large, leather sack full of gold coins. Leaving the coins for the moment, Adrog, Ruby and Arsenios headed north, into a wide tunnel. The rushing water noise became ever louder, and after about 60 feet the tunnel ended at a rocky, hard-packed beach. A rapidly flowing river swept by, the water black. Upon closer inspection, the water seemed to be full of many fast-moving, thin grey shapes. There was no opposite bank – only a wall some 80 feet across the roaring water, which headed away to the northwest. The group searched the walls on either end of the small stretch of beach. This time it was Ruby who found it – a similarly triggered secret door on the northwest wall opened into an unlit and rough tunnel, seemingly following the river, at least as far as Ruby could see. After a brief discussion, the party decided to travel back to town with the gold and their fallen friend. They would return to investigate the secret tunnels, and hopefully they could convince a few more stalwart heroes-to-be to join them.